DESECRATION OF CHURCHES, ALTARS, CHALICES, ETC. A vestment open on each side, with wide sleeves, and marked with two stripes. It is worn by deacons at High Mass as well as at processions and benedictions, and by bishops, under the chasuble, when they celebrate Mass pontifically. The word meme "minister" or servant. These words mean, properly speaking, the act by which a church is solemnly set apart for the worship of God; and afterwards this event is commemorated by THE FEAST OF THE DEDICATION. By consecration churches and altars are solemnly set apart to God's service; by desecration they lose this sacred character, become unfit for the sacred uses which they were meant to serve, and need to be consecrated anew. Their personal existence is clearly taught both in the Old Testament and in the New. Satan slandered Job to God, incited David to number the people, and opposed Josue the high priest. We gain fuller information from the New Testament. There we are told that the devil is a spirit (Ephes. ii. 2); that he is a prince with evil angels subject to him (Matt. xii. 24-26, xxv. 41); ;that the demons were not originally evil, but fell through sin (2 Pet. ii. 4, Jude 6); and it is at least a plausible inference from St. Paul's words, 1 Tim. iii. 6, "not a neophyte, lest, being puffed up with pride, he fall into the judgment of the devil," that Satan fell by pride. All spiritual evil and error (2 Cor. xi. 14, 15), all which hinders the Gospel (1 These. ii. 18, Apoc. ii. 10), is traced ultimately to him. Moreover, although Christ's death was intended to destroy the works of the devil, and has in fact done so to a great extent, still Satan has a terrible power over the world and its votaries, so much so that he is called the ruler and even the "god" of this world (John xii. 31, 2 Cor. iv. 4); and hence St. Paul (1 Cor. v. 6) regards exclusion from the Church as tantamount to a deliverance of the excommunicated person into the power of Satan. At last this power will be destroyed. Satan and his angels will be cast into the lake of fire and brimstone, where their torments will be everlasting. The name by which the tract of country with its population falling under the pastorate of a bishop is now universally designated. Discipline in its ecclesiastical sense signifies the laws which bind the subjects of the Church in their conduct, as distinct from dogmas or articles of faith, which affect their belief. The relaxation of a law in a particular case. 1. The marriage bond may be dissolved, even between baptized persons, by Papal authority, if the marriage has not been consummated. 2. It may be dissolved in similar circumstances by the solemn religious profession of either party. 3. If two unbaptized persons have contracted marriage, this marriage, even if consummated may be dissolved, supposing .one of the parties embraces the Christian religion and the other refuses to live peaceably and without insult to the Christian religion in the married state. In all other cases the marriage bond is indissoluble, and, besides this, married persons are bound to live together, as man and wife. They may, however, separate by mutual consent, and, again if one party exposes the other to grave danger of body or soul, or commits adultery, the innocent partner may obtain a judicial separation, or even refuse to cohabit without waiting for the sentence of the judge, provided always that the offense is clearly proved. Dogmatic Theology is the science of Christian dogma. Dogma, in its theological sense, is a truth contained in the Word of God, written or unwritten - i. e. in Scripture or tradition - and proposed by the Church for the belief of the faithful. Thus dogma is a revealed truth, since Scripture is inspired by the Holy Ghost, while tradition signifies the truths which the Apostles received from Christ and the Holy Spirit, and handed down to the Church. St. John mentions that the Blessed Virgin, with other holy women and with St. John, stood at the foot of the cross when the other Apostles had fled. At that time the prophecy of Simeon, "a sword will pierce thine own soul," was most perfectly fulfilled; and very naturally the sorrows of Mary have been a subject of contemplation to the Faithful. "Lord, I am not worthy that Thou shouldst enter under my roof, but only speak with a word, and my soul will be healed." Words used by the priest before communicating, and again before giving communion to the people. The founder of this celebrated order, St. Dominic, was born in 1170, at Calaruega, a small town in the diocese of Osma, in Old Castile. He was educated at the university of Palencia, which afterwards was removed to Salamanca. After leaving the university he preached with great power in many places. The Bishop of Osma at this time, whose name was Diego, was a prelate of great earnestness and piety; the laxity and tepidity which prevailed among a portion of the Spanish clergy were a serious grief to him, and he pondered how he might introduce the type and germ of a better state of things. He wished to introduce a regular and quasi-conventual life among the canons of his cathedral, and the young Dominic appeared a fit instrument for his purpose. Appointed a canon, and strenuously aiding in the introduction in the chapter of the rule of St. Austin, Dominic more than answered every expectation that had been formed of him, and obtained the entire confidence and affection of the bishop. The southern provinces of France were then teeming with the heresies of the numerous sects which pass under the general name of Albigenses, and the peril seemed imminent that large numbers of persons would before long, if no restraining influence appeared, throw off the bonds of religion, social order, and morality. In 1215 Dominic had gathered round him sixteen men, of whom eight were Frenchmen, six Spaniards, one an Englishman, and one a Portuguese – all prepared to embrace any way of life that he might prescribe to them. Pope Innocent III., upon the understanding that the founder should choose for the new institute some rule already sanctioned by the Church, and that the statutes of the order should be submitted for his approval, consented to the desire of Dominic and his companions. Dominic selected the rule of St. Austin for the use of his order; many of the statutes were adapted from those of Prémontré. When everything had been settled, and the first monastery was being built at Toulouse, Dominic went to Rome to obtain the final confirmation of the Holy See. Arriving in the autumn of 1216, he found Honorius III. occupying the Papal chair, and obtained from him in the following December a bull fully legalizing and confirming his institute, under the title of the "Preaching Brothers." 'He made his solemn profession before Honorius, as the first member of the order, and then returned to Toulouse. Into the intellectual movement of the age, of which the foundation of many universities, and the rapid development of others were the chief outward signs, the Dominicans eagerly gave themselves. Albertus Magnus, entering the order in the time of the second general, Jordanus Saxo, lectured in the university of Paris on the philosophy of Aristotle. His fame was eclipsed by that of the still larger and stronger mind of him who was his ardent disciple, and also a Dominican, St. Thomas of Aquinas. The "Summa Theologiæ," has been commended to the respect of all Christians and the careful study of the clergy, by the late Pope Leo XIII. 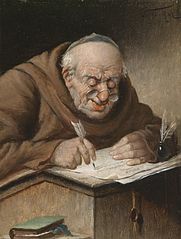 The system of St. Thomas was so vast as to afford scope for the labor of many commentators, and a school hence arose, consisting chiefly of Dominicans, named Thomists. ("The Lord be with you") is, with the "Pax vobis," the common salutation in the Mass and office.